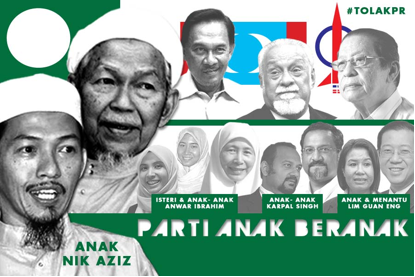 Home / DAP / HUDUD / KHAWARIJ / PAS / PKR / PRU 13 : CAMPAIGN TRAIL REFLECTS DISUNITY IN PAKATAN, HOW TO RULE THEN? PRU 13 : CAMPAIGN TRAIL REFLECTS DISUNITY IN PAKATAN, HOW TO RULE THEN? Now they are fighting against each other again…not two times but many times since they got ‘married’ under the unregistered name of Pakatan Rakyat (PR), just like unregistered marriage or marriage of convenience. PAS deputy spiritual head Dr Haron Din said DAP was receptive to PAS’s Islamic policies which of course included Hudud Laws when the party agreed to use PAS logo if the logo Rocket got barred by the Registrar of Society (ROS). Karpal Singh of course responded immediately saying the party was still against the Hudud despite using PAS logo. And PKR Khalid Ibrahim went on to add that Hudud Laws could not be imnplemented in Malaysia because the Federal Constitution bars it. In short, DAP and PKR are against Hudud and the implementation of Islamic laws, which PAS has been fighting and advocating since 1950s. And not to forget, DAP leaders consider PKR leaders as jokers who dance around on stage like a jerk, who make stupid statements that do not reflect any leadership qualities and who do not keep their promises since they came to power in Selangor. So the three parties are not insync, meaning not dancing the same tune as each dance accordingly to their own tunes and beats, never care less about the audiences who are watching every step they make. Now the three parties are campaigning together at some constituencies, putting up a united front while at the same time, in small groups, DAP goes on its racial politics, without the knowledge of the other parties. This tricks have been going on for so long and PAS and PKR know but they do not care because they have their own agenda. 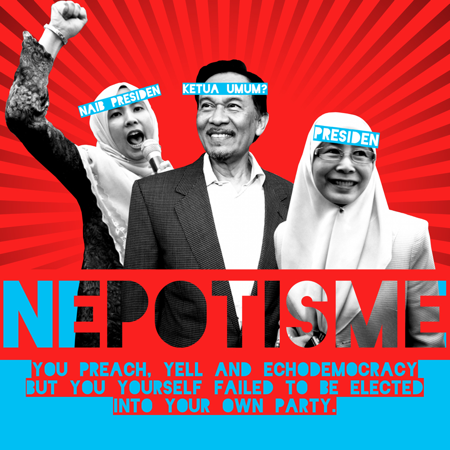 Each of the party has its own agenda and they do not care what the other is doing so long as they have the numbers to take over Putrajaya – its machiavelan – the ends justify the means. To them, the rakyat and voters are just ‘toys in a game of chess’, not worth the effort of listening to their needs and grievances. To them, the rakyat are only meant to put them at Putrajaya after which they are not needed as the leaders of the opposition pact will be busy on fighting who will be Prime Minister and what policies to be implemented. Thus, the campaign trail now reflects the their disunity and their disagreement on fundamentals which make them unsuitable and not fit to be at Putrajaya.